Property Location When you stay at The Sabal Hotel in Ocoee, you&apos;ll be in the suburbs and within the vicinity of MetroWest Golf Club and Turkey Lake Park. 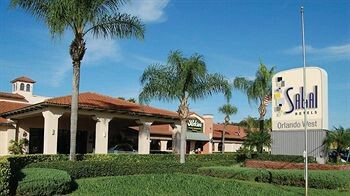 This hotel is within the vicinity of University of Central Florida Valencia West and Isleworth Golf and Country Club.Rooms Make yourself at home in one of the 55 individually furnished guestrooms, featuring refrigerators and microwaves. Your room comes with a pillowtop bed. 37-inch flat-screen televisions with cable programming provide entertainment, while complimentary wireless Internet access keeps you connected. Private bathrooms with shower/tub combinations feature complimentary toiletries and hair dryers.Rec, Spa, Premium Amenities Be sure to enjoy recreational amenities including an outdoor pool and a spa tub.Dining Satisfy your appetite at the hotel&apos;s restaurant, which features a bar and a pool view. Quench your thirst with your favorite drink at a bar/lounge. Cooked-to-order breakfasts are available daily for a fee.Business, Other Amenities Featured amenities include a 24-hour business center, complimentary newspapers in the lobby, and dry cleaning/laundry services. Planning an event in Ocoee? This hotel has 1357 square feet (122 square meters) of space consisting of conference space and meeting rooms. Free self parking is available onsite.